The dust bowl, the dirty 30s, the great drought, no matter what you call it, the dry conditions during the 1930s in North Dakota were some of most extreme since European settlement of the state in the latter half of the 19th century. Low commodity prices in combination of poor crops yields proved devastating to a rural state like North Dakota. The population of the state peaked in 1930 and saw a steady drop for the next 20 years. The decade of the 1930s tends to get lumped into a decade of persistent heat and drought, yet, much of the reputation of that decade come from just two of those years, 1934 and 1936. Using data for the three warmest months of the year, June through August, the summers of 1934 and 1936 were the only ones with drought conditions observed throughout the entire state of North Dakota. Plus, those two summers extreme drought was observed in the entire state during the summer of 1934 and in most of the state in 1936. The eleven years of 1930 to 1940 all recorded some portion of North Dakota in drought during one of the summer months (June through August). The most severe drought conditions occurred in 1934. The month of August was particularly severe that year, not only in North Dakota, but in much of the central and western portion of the United States. Warm season precipitation is critical in the northern plains. 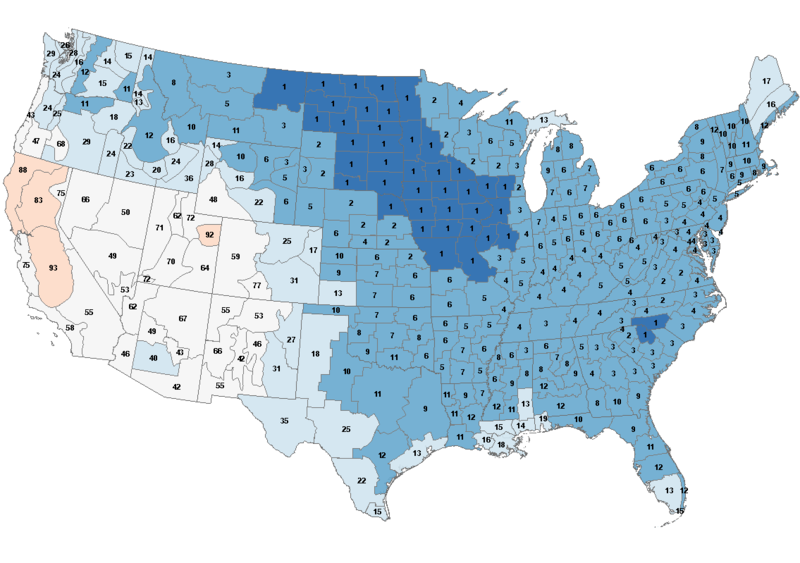 With a strong continental climate, winters are generally cold and dry. The state wide average precipitation is less than 18 inches with approximately 4 inches of that coming during the six coldest months from October through March. The cold season is dominated by cold intrusions from the polar and arctic regions bringing with it very little moisture. In the spring with the shift in the mean low level wind flow transitioning from the northwest to a more southerly flow, there is a slow transition of Gulf of Mexico moisture that surges north that ends up bringing beneficial rains to the upper Midwest. 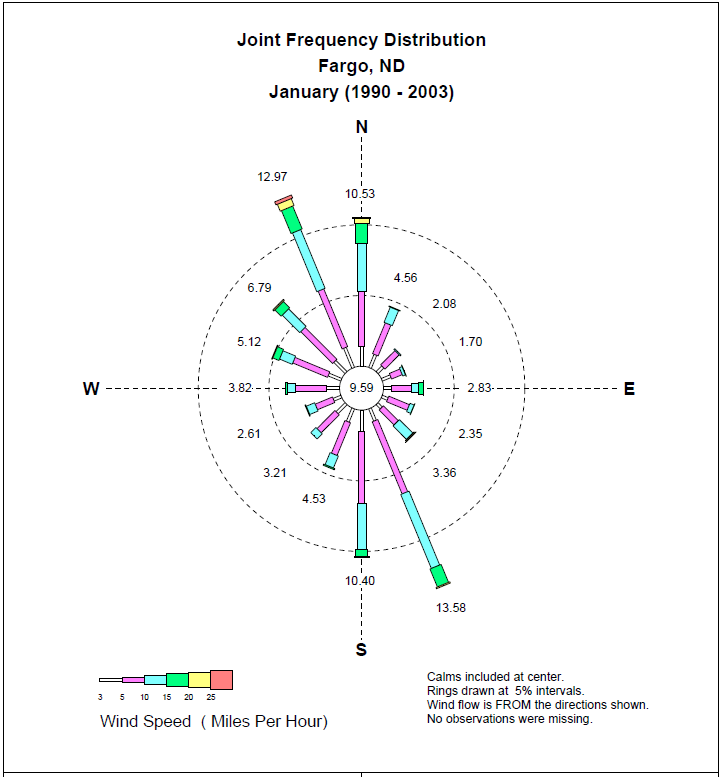 Subtle changes in the mean low level wind in combination with the position of the jet stream have a significant impact on the amount of moisture recorded in not only North Dakota but also in any other location in the Great Plains. The summer of 1934 was the culmination of several previous dry summers. 1928 was an exceptionally wet summer for the state, it currently ranks as the 2nd wettest summer of record with a statewide average precipitation of 13.14 inches. Yet, the proverbial faucet was abruptly shut off after that warm season. The summer of 1929 was the exact opposite of the previous summer. 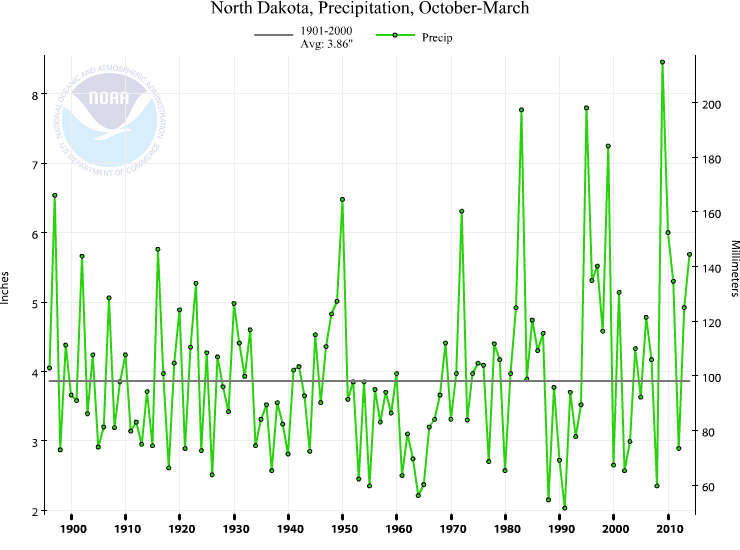 Through 2013, 1929 was the driest meteorological summer of record for the state of North Dakota and the 6th driest warm season (April through September). Dry conditions continued in 1930, 1931, 1932 and 1933 but those years were not as severe as those recorded in 1929. 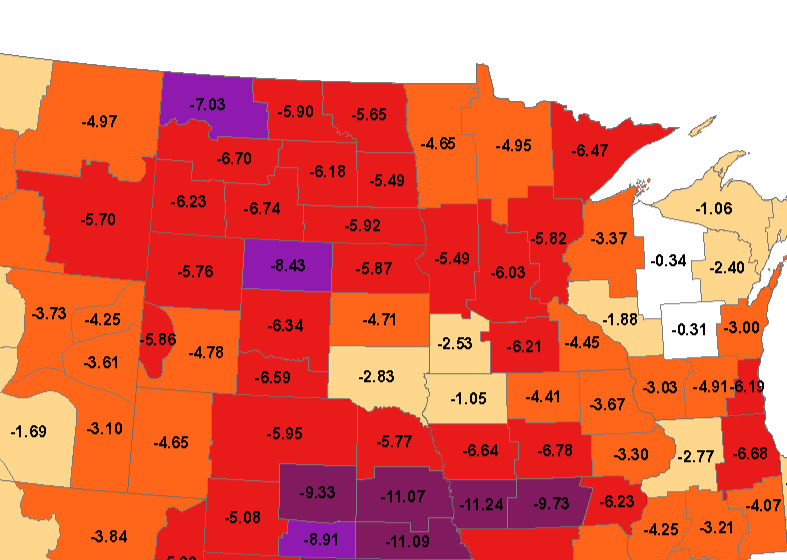 During that stretch of below average precipitation years, the northern portion of North Dakota was the most severely hit. The northern one-third of the state were frequently listed in severe or extreme drought during those growing seasons, with the southern portions of North Dakota mostly avoiding drought during that time frame. By the time the warm season of 1934 arrived, much of the state had limited soil moisture reserves. The severe dryness of that year was in turn poorly timed. Average rainfall from April through September was only 7.22 inches. Barely more than 1 inch per month. That currently ranks as the 2nd driest such period on record. The following year, 1935, brought temporary drought relief to the area. By the end of August, moist conditions could be found in many parts of the state. By the end of 1935, many farmers, especially in North Dakota thought the dryness that plagued the state was coming to a close, but little did individuals realize that the most extreme year that they would ever experience was about to impact much of the north central United States. The year 1936 started with the most severe cold wave on record. From the middle of January through the middle of February, most of North Dakota did not record a high temperature above 0 degrees Fahrenheit. In fact, Langdon recorded 42 consecutive days during that time frame without the temperature exceeding 0 degrees. That winter of 1935-1936 was the coldest on record for all of North Dakota and much of the rest of the immediate area. It was toward the end of that horrific cold snap that the coldest observed temperature in North Dakota was recorded. On Saturday, February 15, 1936, cooperative observer Court Shubert recorded a temperature of -60° F. Bismarck reached -42 degrees that morning, just 3 degrees shy of the all-time lowest temperature for that location. That brutal winter was followed by an equally brutal summer. Although the summer of 1988 did finish slightly warmer for the period of June through August, no other summer, including 1988 recorded a heat wave like what was observed in July 1936. 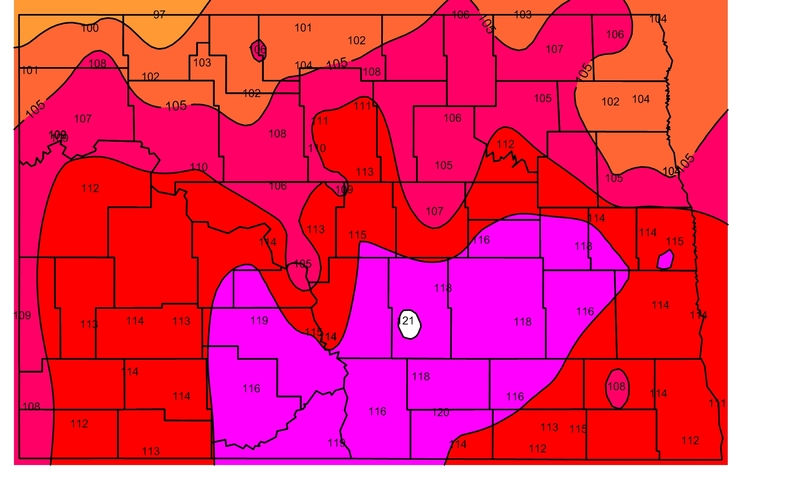 From July 5 through July 18, the temperature was near or over 100° in much of the state. It was a stretch of high temperatures not observed at any other time since records have been kept. Low temperatures were frequently in the 70s to near 80° during that time period forcing many families to either sleep in their cellars or outside as air conditioning was unheard of at the time, plus many rural areas were still without electricity. The warmest day at most locations was on July 6, 1936. That was the afternoon that the highest temperature recorded in North Dakota occurred in Steele, ND with a recorded high of 121°. In her notes on the cooperative observer’s form, Mrs. R.S. 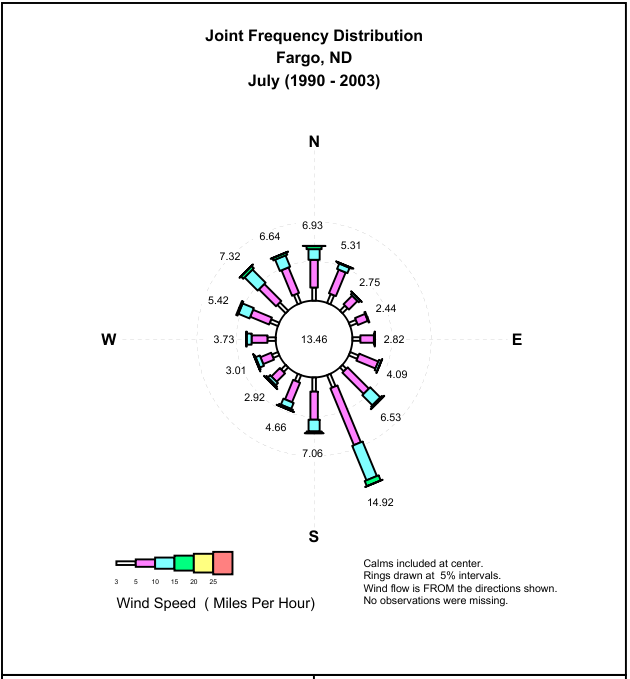 Armstrong, the observer that recorded that temperature on July 6, noted, “Hot winds. Leaves on trees and shrubbery cooked”. Two days later Mrs. Armstrong noted a severe dust storm impacted her area and many other observers also made notes of dust storms periodically during that exceptionally dry and hot. With such excessive heat, precipitation was scarce in July, 1936. What little moisture that did fall, quickly evaporated and did little but briefly settle the dust. Therefore, not only was July 1936 the warmest month on record, but also the driest on record for most of the state. The high evaporation rates in combination with limited rainfall pushed the drought conditions in the extreme category for much of the north central portion of the United States. 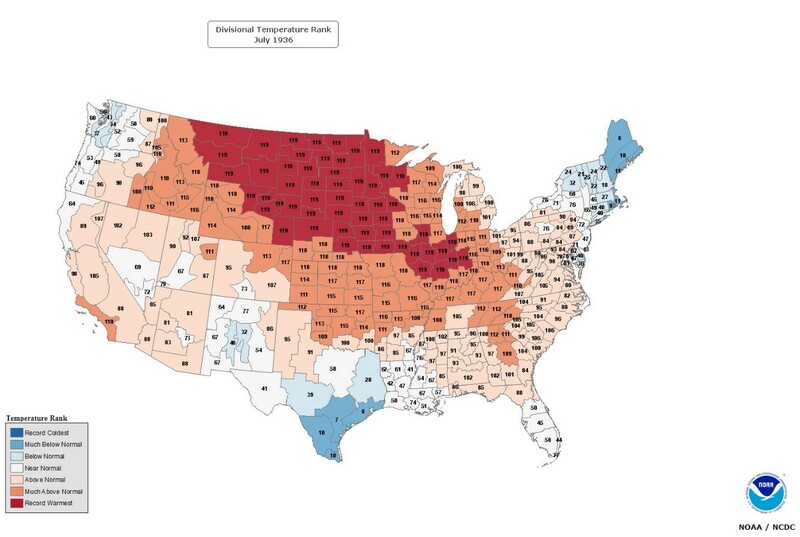 The extremely dry and hot summer of 1936 was following by a very snowy winter for the eastern one-third of both North and South Dakota and in much of Minnesota. Fargo, for example, recorded a then record winter snowfall of 82.3 inches of snow. Areas to the south of Fargo recorded even more snowfall which would lead one to believe there would be a significant possibility of Red River flooding during the spring of 1937. Yet, the Red River at Fargo crested at a mere 10.17 feet on April 12, 1937. The reason? Most of that snow was absorbed by the bone dry soil from the severe drought of 1936, plus, the Red River was for all practical purposes dry or partially filled with stagnant pools of water during the previous year, meaning, the abundant snow during the winter of 1936-1937 did nothing more but to get the river flowing again after that long snowy winter. The rest of the 1930s continued to be dry with warm summers. 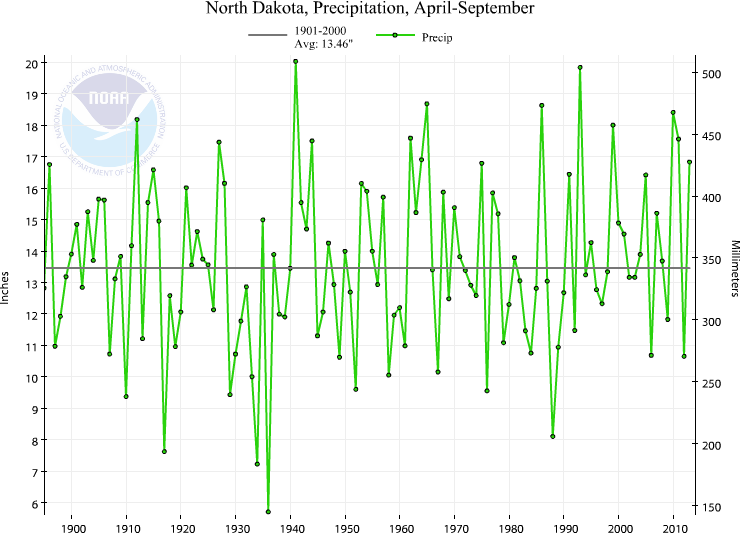 Although not as blistering as the summer of 1936, the summer of 1937 finished with well above average temperatures with severe to extreme drought conditions present during the growing season in the southern half of North Dakota. Two years later, the growing season of 1939 was again, a very warm summer, currently ranked in the Top 10 warmest for most locations in the state. Extreme drought was observed in the summers of 1939 and 1940 in the Red River Valley in eastern North Dakota and adjacent areas in western Minnesota. 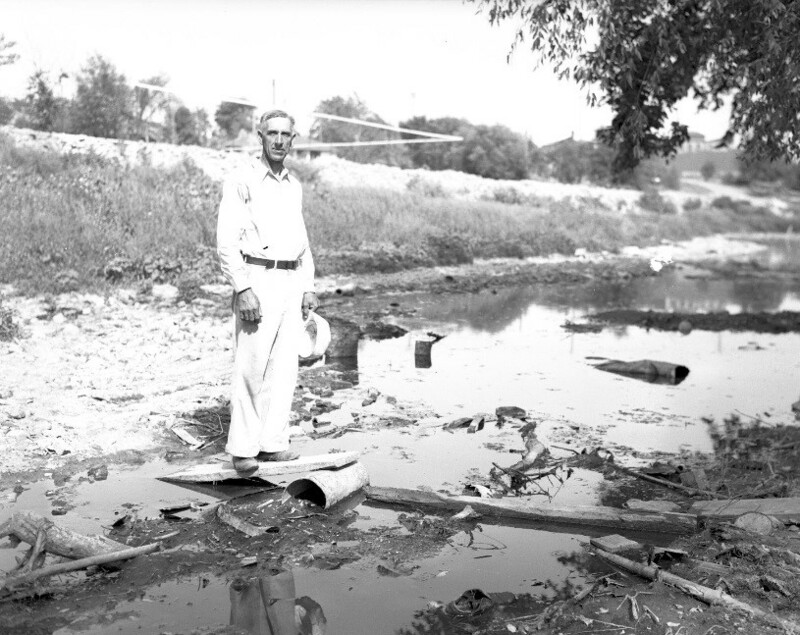 It wasn’t until the cool, wet summer of 1942 that the drought truly ended for residents of North Dakota. There were certainly an occasional year when portions of the region did not receive enough rainfall and brief drought conditions id occur, but after the 1930s drought, a widespread severe or extreme drought did not impact North Dakota again until the 1970s. A drought with nearly the same severity of what happened in the 1930s did impact the Great Plains during the decade of the 1950s, but unlike what happened in the 1930s, the 1950s drought did not impact North Dakota. 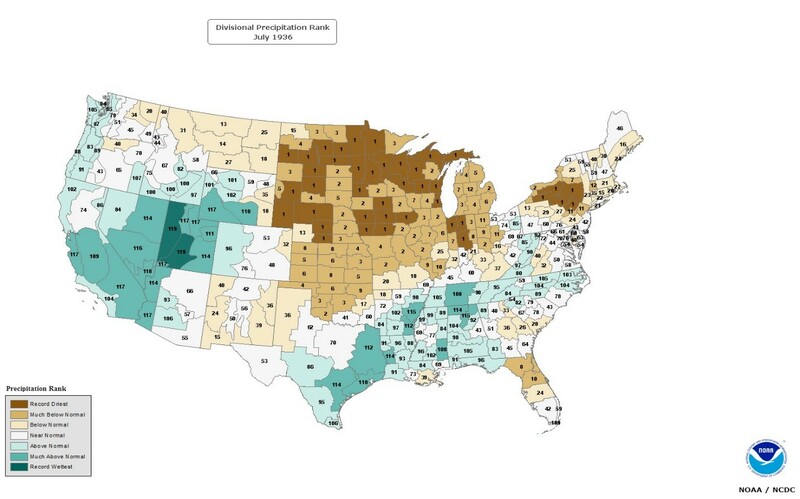 The extreme drought of the 1950s impacted mainly the central and southern Great Plains. 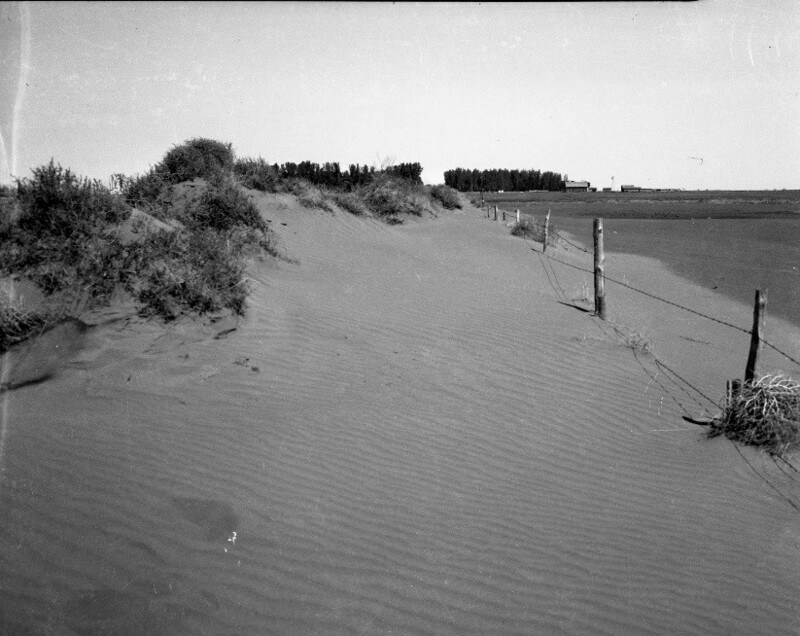 A Dirt Drift after a Dust Storm in summer 1936.